North Kildonan Mennonite Church, July 2017. The North Kildonan Mennonite Church in Winnipeg, Manitoba traces its beginnings to the Mennonite immigrants from the Soviet Union that came to settle in what was then a rural area on the northern edge of the city of Winnipeg in 1928. They settled on small farm properties to meet the immigration requirements of the time. They were also close enough to an urban settlement where earnings could be supplemented through employment in service industries, in domestic positions, and in construction projects. The Mennonites in North Kildonan initially met in homes to worship. The Mennonite Brethren in North Kildonan built their first worship building 1929. They were assisted materially and spiritually by adherents of the Schoenwieser Mennonite Church group who also worshipped with them. In 1935, the families which were affiliated with the Schoenwieser Mennonite Church group organized their own group and built a meetinghouse at 256 Devon Avenue. This marked the beginning of the North Kildonan Mennonite Church as an affiliate of the Schoenwieser Mennonite Church group. Their building on Devon Avenue was expanded in 1938 and in 1943. In 1951 a basement structure for a new worship site was completed at 1131 Roch Street. When a significant influx of new Mennonite settlers arrived, the upper level was completed in 1956. Further expansions took place in 1964 and again in 1980. 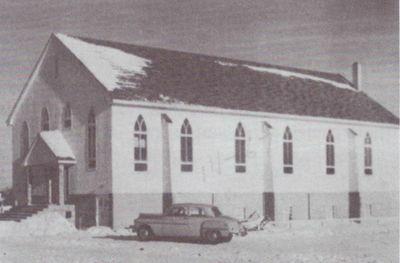 The North Kildonan Mennonite Church became independent of the Schoenwieser group in 1957. Until then, they called regularly on the services of Aeltester J. H. Enns, for baptisms and communion services. Daniel Loewen worked closely with Enns, as Assistant Aeltester. A close relationship with First Mennonite Church, where J. H. Enns was based, was maintained for many years after they became independent. The North Kildonan Mennonite Church continued to grow rapidly during the late 1950s and early 1960s with more immigrants from Europe and South America, so that another congregation, Springfield Heights Mennonite Church, was founded in 1964. The language of worship was only German at the beginning. This language was fostered and greatly encouraged among the children. In 1938 Anna Vogt began the first German Kindergarten in North Kildonan. Both English and German were used as the languages of worship for many years, with English becoming more and more prominent in the 1970s. Canadian Mennonite (20 May 1960): 23. 50th Anniversary: North Kildonan Mennonite Church 1935-1985. Winnipeg, MB, 1987. Fast, Karl, ed. Fiftieth Anniversary of the Mennonite Settlement in North Kildonan. Winnipeg, 1978. Fast, Karl. Fuenfundzwanzig Jahre der mennonitischen Ansiedlung zu Nord Kildonan, 1928-1953. 1953. "Get To Know Us: History." North Kildonan Mennonite Church website. Web. 2 August 2018. http://www.northkildonanmc.com/about/. North Kildonan Mennonitengemeinde, 1935-1975. Winnipeg: North Kildonan Mennonitengemeinde, 1975. General Conference Mennonite Church (1959-1999). Enns, John H. and Marlene Epp. 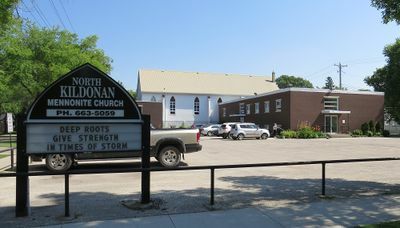 "North Kildonan Mennonite Church (Winnipeg, Manitoba, Canada)." Global Anabaptist Mennonite Encyclopedia Online. November 2015. Web. 23 Apr 2019. http://gameo.org/index.php?title=North_Kildonan_Mennonite_Church_(Winnipeg,_Manitoba,_Canada)&oldid=161315. Enns, John H. and Marlene Epp. (November 2015). North Kildonan Mennonite Church (Winnipeg, Manitoba, Canada). Global Anabaptist Mennonite Encyclopedia Online. Retrieved 23 April 2019, from http://gameo.org/index.php?title=North_Kildonan_Mennonite_Church_(Winnipeg,_Manitoba,_Canada)&oldid=161315. This page was last modified on 3 August 2018, at 02:47.